One of the most popular brands of instant noodles in Nepal produced by Chaudhary Group under the name of CG FOODS (Nepal) Pvt. Ltd., Wai Wai has been serving as a favorite snack for millions of Nepali for about past two decades. Although there are over twenty different brands of instant noodles in Nepal that offers variety of seasoning, flavors and diets, none has been able to shake Wai Wai from its top position neither have they been able to over shadow its popularity. It has always been “hami sabaiko WaiWai” (our own Wai Wai) as its tagline says. It is one of the most popular brands in Nepal and is popular not only in Nepal but also in India and other Asian countries. It is one of the most common brands of dry foods in Nepal and is available in any part of the country. It is available in both chicken and vegetable flavor. It can be straight from the packet or can be cooked as a soup or mixed with vegetables. It is brown noodle which is pre-cooked, flavored, seasoned and fried before packaging. Various flavors of seasonings are available and a pack of Wai Wai include a small sachet of chili powder, masala (mixed spices) and onion oil that are used to prepare soup. Although the chicken and vegetarian flavors are most common, Wai Wai is also available in other flavors like spinach, Manchurian and a new sub brand known as Wai Wai Quick, also available in various flavors. It is also one of the popular snacks for school, college and office goers. 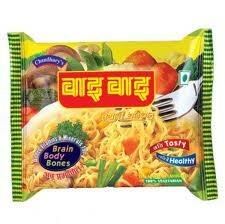 This quick to make noodle is fast and tasty as well as cheap compared to other snack items and also satisfies hunger. It is also available in cups. However, it is forbidden for infants below one year age and also one case of bone malfunction of a 12 year old had occurred due to heavy intake of Wai Wai. It is a good snack if taken in limited quantity. It used to be exported to India as well and due to rising popularity of Wai Wai in India, CG Foods opened three factories in India. It is popular not only in Nepal but about thirty countries around Asian and Europe with most foreign tourist developing a taste for it and importing it to their countries. The theme of the advertisement of this noodle is also good as it reflects upon the unity among the diversity in Nepal. It shows people enjoying the noodle together despite their age, gender, caste and ethnicity. 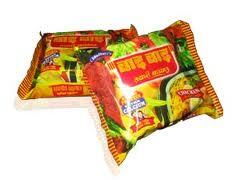 Because of its popularity, Wai Wai has become a synonym of instant noodles in Nepal. And, why not! After all, it is “hami sabaiko Wai Wai“.